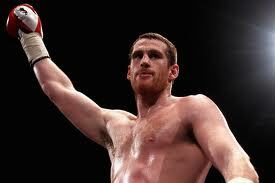 Last night David Price proved he can knock out a nineteen stone, out of form, head-not-in-it John McDermott. They fought for less than half a round with McDermott hitting the floor three times, and after the third he couldn't beat the count. England has a new heavyweight champion, and Tyson Fury has a new opponent. Immediately after the knockout the Olympia exploded, as did Twitter where shouts of “David Price will be the next world champion” flew across wifi and into peoples laptops, phones and PCs like migrating geese. I was at the Olympia and stayed for a decent undercard, including a shut-out win for cruiserweight prospect Danny Price, and I thought it was an okay show. A hell of a lot of people piled into the old theatre at nine o'clock for the main event, sat in their seats for just over a minute and got back up again, £35 poorer but full of David Price hype. David Price has a lot of hype to live up to. Price (12-0-0) has been talked-up for the last year but he has always had a question mark over him due to his lack of quality opposition. A lot of boxing fans think last night answered that question; I don't. John McDermott is a good fighter and has done enough over his career to escape 'journeyman' status, but the John McDermott we saw at the Olympia was not an elite fighter. "This is my last chance. If I lose this there's no point in carrying on. I'll fight to the death. This is the toughest fight of my career." Interestingly, Tyson Fury said the same thing before his fight with John McDermott. There is a deep fear in the British domestic scene of becoming a journeyman, the type of fighter who, to use a famous Joe DeGuardia quote, is "a body for better men to beat on". McDermott had lost the last four out of five fights, against Tyson Fury (twice) and Danny Williams (twice). A wide boxing audience think that McDermott won two of those fights, and that the Basildon-born heavyweight finds it hard to get a decision. He also seems to find it hard to motivate himself in boxing any more, understandably now that he is seen as a stepping-stone for British heavyweight prospects. Price's knockout was exciting but it told us nothing except the guy has nuclear fission in his right arm. The old chants of 'glass jaw' are still there because Price was only hit twice, meaning it would have done Price good if the fight were more competitive and he had taken a few punches. It is too early to talk about Price taking on the Klitschkos, or even Alexander Povetkin. His next step seems to be Tyson Fury, the entertaining-but-flawed Commonwealth heavyweight champion. There is a Manchester-Liverpool rivalry at work here, and the fight could do mega-business at the Manchester M.E.N. Arena. Seriously, Frank Maloney and Mick Hennessey could have one of the biggest domestic fights in the last five years on their hands, but after seeing the obliteration of John McDermott last night, will Tyson Fury defend his belt against David Price? I hope so.